100cm - 160cm on average, rarely getting up towards 2m. Morelia viridis has a large distribution throughout Eastern Indoneasia, Papua (New Guinea) and it's numerous surrounding small islands, including the two larger islands of Biak and Japen and also the Aru Islands group. Lowland forests and rainforest up to an elevation of 2000m. 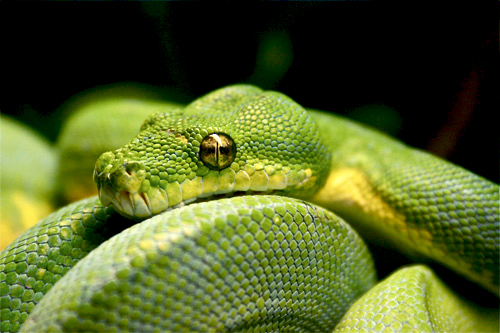 Studies show (Wilson, Heinsohn and Legge 2006) that when young, Morelia viridis inhabits the forest edge and canopy gaps rather than the closed canopy forest that the adult animals inhabit. Commonly known as the Chondro because of it's old scientific name Chondropython viridis the green tree python has been placed in the genus Morelia since 1990 as a single species. Recent studies give evidence that populations found to the north of the dividing mountain range in New Guinea differ significantly from those found to the south. This evidence may warrant that the species be split into more than one species or at least into two or more subspecies at a later date. Green tree pythons are a fairly small slender python. Adults typically have a green body colour fading to a white, cream or yellow on the belly. They vary in patterns and markings on the body with blue and white patterns and coloured scales along the dorsal and lateral surface. Some adults, especially animals from the island of Biak can retain a large amount of yellow colouration from their juvenile stage. As a general rule animals found to the north of the dividing mountain range tend to show more blue markings along the dorsal scales and animals to the south can have more white scales along the dorsal with animals from the very southern part of New Guinea and from Australia often showing a full white dorsal stripe. There is however, a great variation in the colour and patterning of this species (although sometimes quite subtle) throughout it's range. 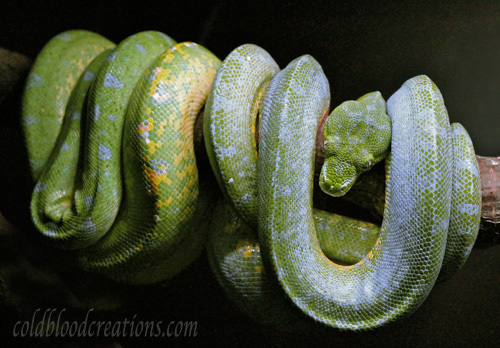 The variation between adult and young green tree pythons is even more extreme. Undergoing an ontogenetic colour change as they mature, young viridis begin life as either yellow or red/ maroon hatchlings. They develop their green colouration between six months and two years of age although animals from the islands of Biak and Kofiau can often take longer than two years to turn green and will retain a great deal of yellow colour long into adulthood. Again as with the adults there is a difference between the Northern and Southern populations with regards to colour. Hatchlings of Southern populations are yellow however clutches from Northern populations can contain red, yellow or maroon coloured hatchlings. Even though the three images below are of different animals, they clearly show the ontogenetic colour change from hatchling on the left to adult on the right with the intermediate stage in the middle image. It is believed that the difference in adult and juvenile colouration is for camouflage and varies due to the different habitats of the adults and juveniles. The green colour of the adults would help conceal them against leaves in the canopy and the young colours of reds and yellow may help them hide better in shrub and grassland. Eye colouration can be varied but the eyes will almost always have a coloured line running though them from nose to neck and will follow a line of coloured scales on the head of the snake, as can be seen in the image above and more subtly in the image below. You can also see in both these images the heat receptive pits in the upper and lower jaws. 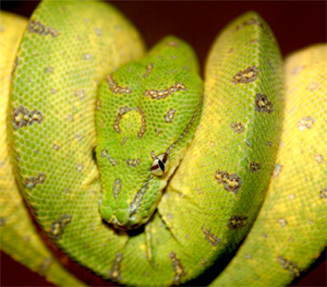 Morelia viridis are nocturnal and completely arboreal. They spend the daylight hours resting in a characteristic coil draped over branches higher up in the canopy. They will travel down from the canopy to wait in ambush for prey at night. Often found within a meter of the ground on a vertical vine or a small tree trunk with their necks in an "S" shape ready to strike at any passing small mammal. Whether adult or juvenile most green tree pythons tails are darker coloured towards the tip. They use the darker portion of their tails to caudal lure, wiggling the end of the tail to simulate a small grub or worm to entice prey within striking range. Green tree pythons are fantastic display animals and will often sit in full view in a terrarium when the lights are on. This along with their small slender size means they can be kept in ornate, natural looking terraria creating a focal point to rival the best aquariums. Morelia viridis do require a little more attention to detail in their maintenance compared to, for example a carpet python, especially with regards to humidity. Before going through the main points of captive care, it should be stressed that young Morelia viridis (under a year old) are extremely delicate, having especially small delicate bones in their tails and great care should be taken when handling them. Housing. 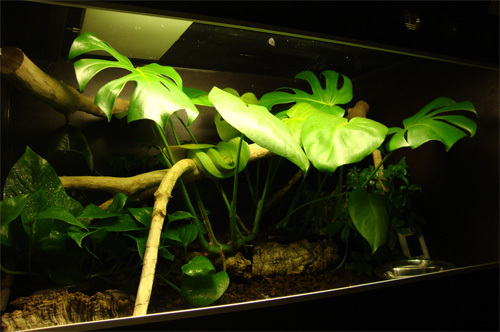 There are various options as to how you can house your green tree python, including, all glass terrariums, plastic boxes, home built wooden terrariums and commercially made acrylic or plastic terrariums. All these examples have advantages and disadvantages compared with each other such as cost, how well they hold heat / humidity and how easy they are to keep clean. Young animals tend to do very well in small plastic tubs in a rack style set up for the first six months. The humidity can be easily maintained and this will help keep the tiny snakes hydrated and help them shed well. The substrate can be paper towels as they are easily changed to clean the enclosure and will help keep the humidity up if kept slightly damp. Small plastic perches no larger than the diameter of the snake should be provided and positioned to allow the animal to thermo regulate between the warm and cooler sides of the box. I raise baby viridis in 35cmL x 15cmW x 11cmH boxes. Once the animals are around six months to a year old and have been feeding well and gained some weight they can be moved into a larger tub or terrarium. Terrariums are best set up with branches that are the same diameter or thinner than the snakes body with lots of plants (live and/or plastic plants) to give cover over the branches. If you have to search the terrarium to find and see your young green tree python because of the amount of cover from plants then the chances are that it can't very easily see you or what is going on outside the terrarium and so will feel secure and not stressed. Substrate in the enclosure can be as simple as newspaper / paper towels or more pleasing to look at, bark chipping's. The substrate needs to absorb waste matter and hold some moisture to help keep humidity up in the enclosure. Bark chip substrate will need to be spot cleaned and paper will need to be replaced when soiled. I keep my adult and sub-adult snakes on a soil substrate that lets me control the humidity in my enclosures at consistent, relatively high levels. There is more information about the soil substrate I use in the terrarium section of this web site. 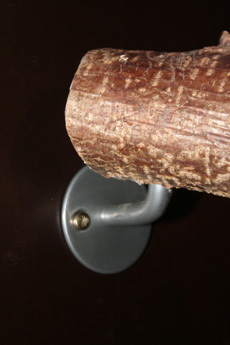 Perches can be made from plastic pipe or cut branches. Most tree branches are suitable although pine trees should be avoided as they produce a sticky sap that will irritate the snakes skin. Branches can be sealed with varnish to stop them rotting in the high humidity and to allow easier cleaning but must be fully dried out before coating with varnish. 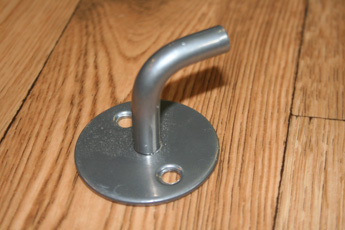 I use hooks from a local DIY store to fix perches for my arboreal snakes. Various diameter perches should be provided, ranging from 25% to 75% of the snakes body diameter and should be fixed firmly in place. It is a good idea when fixing perches into the terrarium to do so in such a way that they can be easily removed. This will allow you to remove a coiled Green tree python from an enclosure by removing the perch that it is resting on rather than trying to coax the snake off it's perch. Plants (real or fake) can be used to provide some cover above perch positions and will offer some security for the animal. By drilling a hole into the branch that is the same diameter as the hook, branches will sit securely but also be easy to remove for tank maintenance or removing an animal that is resting on a perch. 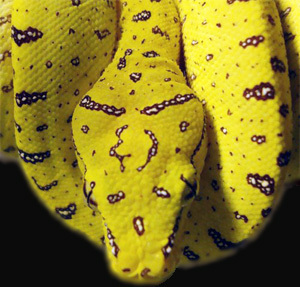 Humidity.Green tree pythons require quite high humidity (60%-80% RH). This should be provided but care must also be taken not to allow the terrarium to become and remain too wet. Spraying water over the substrate on a daily basis can help keep humidity levels up. The surface of the substrate should be allowed to dry out over the following 24 hrs after spraying. Temperature. 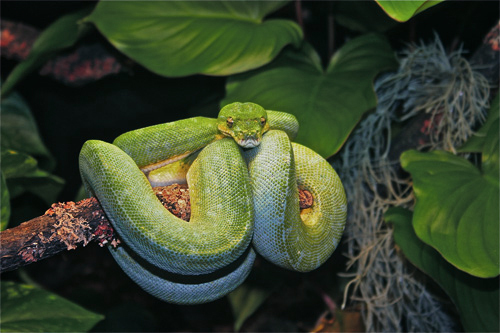 Green Tree pythons require a temperature gradient within the enclosure. This allows the snake to choose the temperature that it needs at various times. In general the enclosure should have a warm side and a cooler side. Heat can be provided by heat mats, heat panels, heat cable or ceramic heaters. Again there are advantages and disadvantages to each but whichever heating method you choose, it should be controlled by a reliable thermostat. I provide my adult animals with a daytime air temperature of 28 deg C to 24 deg C using heat panels controlled by pulse proportional thermostats. I provide a basking area under the heat panel that reaches a temp of 30 deg. At night the air temp drops to 26 deg to 23 deg. I provide young viridis with a constant temp gradient of 29.5 deg at the warm side of their tubs to 27 deg on the cool side with no night time drop. Lighting. Although nocturnal, green tree pythons will still benefit from some sort of light reaching their enclosure. It can be as simple as making sure the area in the house where they are kept receives some natural light from a window each day or by using artificial lights inside the enclosure. I light my green tree enclosures with LED lights and with full spectrum fluorescent and provide a 12 hour light cycle as this replicates their natural environment. The full spectrum fluorescent also help provide enough light for the plants in the terrariums. Food. Very young green tree pythons will eat small defrosted pinky mice and can be fed every four to five days. As the snakes grow, the size of the mice should be increased and it is a good idea to get them on to fuzzy mice as soon as they can take a meal this size. Once they are big enough to take fuzzy mice I feed around once a week. Between a year and two years of age feeding can be reduced to every seven to ten days. Adults and animals over two years of age can be fed one or more appropriate sized defrosted mice every fourteen days for females and males will be ok if fed every three weeks. These are just rough guidelines for feeding frequency and feeding less in my opinion is better than feeding more. In the wild snakes are opportunistic feeders and food does not come along on a regular schedule. I follow the above feeding schedules loosely and prefer to watch what the snakes are doing. When they become more active after digesting a previous meal and seem to be actively looking for food I will wait a day or two before feeding them again. I don't believe it does the snakes any good to keep feeding them on a set schedule if they are not actively moving around their enclosures at night, as this could eventually lead to an obese snake. Morelia viridis can get very lazy if they are fed too frequently without moving in between meals. As a rough guide to how big a meal your tree python will eat, I offer young animals up to two years of age rodents that are up to 15% of their body weight and animals over two years meals up to about 10% of their body weight. I tend to feed green tree's with maybe two or three smaller food items rather than one large one when they are adult. 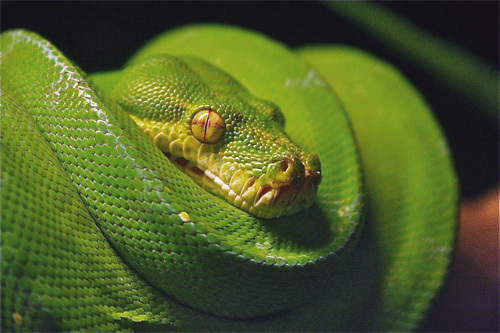 Male green tree pythons will often stop feeding for long periods once they are around two years of age and older. This is a natural behaviour and one that as a keeper you will have no control over. Once the males become sexually active they will have periods when they roam their enclosures at night but will show absolutely no interest in food. During these times they should still be offered food every couple of weeks but be warned, they will only start to eat again when they are ready. This leads onto record keeping. It's a good habit to record dates when your snake is fed, when it sheds and to keep track of it's weight. Not only will this go some way towards avoiding the overfeeding of your snake, it can also help show any health issue that might arise before they become problematic. Water.Water should be provided at all times and should be kept fresh. Plastic, glass or metal containers can be used and the water should be replaced a couple of times a week or when soiled. Bowls should be thoroughly cleaned and disinfected every couple of weeks or again when the water has been soiled. Points of interest.I would like to add some more detail here to the general points above. First of all a little more information about males going off feed. I have found this can happen at any time of the year although it does seem more common in the autumn and winter months and can last a very long time. The longest period so far, that a male in my care has been off food is 156 days, with another male being close behind with a 150 day fast. The male that fasted for 156 days weighed 505g a couple of weeks after he stopped eating and when he began eating again almost 6 months later weighed 404g. The second male weighed 690g at the start of his fast and dropped to 637g just before he resumed eating. This shows that even though the snakes can be very active when they fast they don't loose a huge amount of body weight and so frustrating as it can be it is just another fascinating part of their behaviour. Another interesting point is the clicking and popping noises these snakes make when they are starting a slough cycle. With young Green tree pythons it can be extremely difficult to tell when they are going to shed. Their skin shows very little sign of being opaque before a shed and sometimes the only visual indication that they are going to shed is a slight swollen look to the head. Animals that have undergone their colour change to green are easier to see when a slough is due as they will turn quite opaque but both adults and young will often make clicking, popping and wheezing noises when they breath a couple of days before turning opaque and up until they shed. These noises sound exactly the same as the noises made when a snake has a respiratory infection. Feeding and shedding records can reduce any worries over these noises as a quick check of a snakes records will show if it is due a slough when these noises are heard rather than being the start of an infection. The above information is collected from various sources and from personal observations. The captive care section is based on how I personally maintain this species. This is not the only way to successfully maintain this species and other keepers use different methods. This is what works for me, with my animals and the size of collection that I work with.